With starting RT Bryan Bulaga out for the remainder of the preseason with a sprained ankle, Jason Spriggs and Kyle Murphy will get a bigger chance to prove who will be the line’s swingman this season. Spriggs has struggled throughout the preseason, allowing four sacks and one hit in 40 pass block snaps. His pass blocking efficiency of 88.1 ranked 120th out of qualifying offensive tackles. He hasn’t registered a PFF overall grade higher than 47.4 this preseason. Murphy rebounded from a dismal Week 1 performance in last week’s matchup against Washington. He didn’t allow a pressure in 19 pass block snaps. Additionally, he finished with a PFF overall grade of 77.6. Kevin King, CB – Following a poor showing in the first preseason game, King bounced back against the Redskins with two catches allowed on four targets for 10 yards. Quarterbacks targeting a player in his coverage had a passer rating of 56.3. Christian Ringo, DI – Ringo’s PFF overall grade of 88.5 ranked second among defensive interior linemen in Week 2. His pass-rushing productivity of 7.8 this preseason is 16th among 3-4 defensive ends. Marwin Evans, S – Evans’ PFF overall grade of 91.2 ranks second among all players this preseason. Quarterbacks targeting a player in his coverage have averaged a passer rating of 43.8. He’s allowed only 0.27 receiving yards per coverage snap. Additionally, his six stops ranks second among safeties. 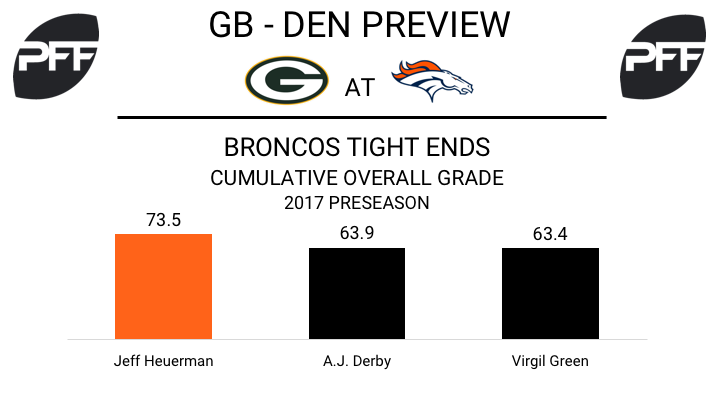 In terms of total offensive snaps, last season the Broncos’ tight end group was led by Virgil Green (485 snaps), followed by Heuerman (235) and Derby (186). At this point, the Broncos’ updated depth chart reflects the same order this year. In 2016, Heuerman earned a grade of 76.6, beating out Green (62.4) and Derby (44.7). Through two preseason games, Heuerman has been the highest graded Broncos tight end with a grade of 73.5 thus far, eight points higher than the next closest tight end. 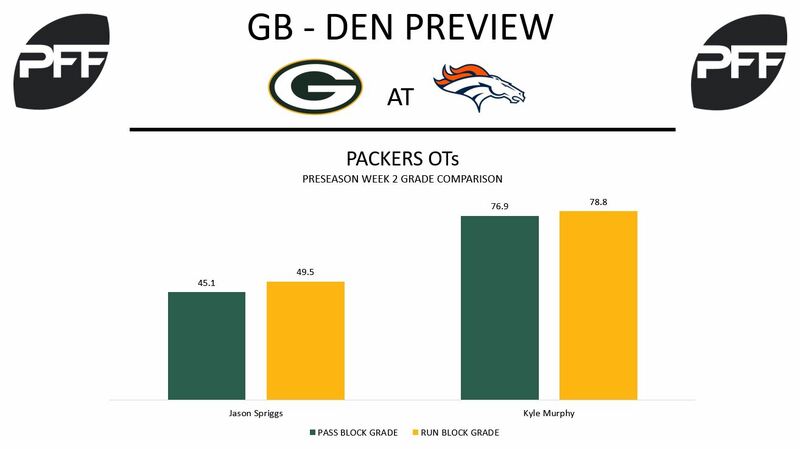 Green has the highest run blocking grade of the group at 77.1, though Derby (75.4) and Heuerman (74.0) aren’t far behind. Heuerman has looked like the better receiver, as he leads the group in receptions (2), catch percentage (100 percent) and yards (16). Adam Gotsis, DI – HC Vance Joseph was reportedly “excited” about Gotsis during the offseason. Through two games Gotsis has yet to impress, posting a cumulative overall grade of 41.7 thus far. He has showed some promise, posting a pass-rush grade of 71.9 in his first game and recording one stop in each game. He will see if he can get things going against the Packers, whose offense has cumulatively graded seventh worst. 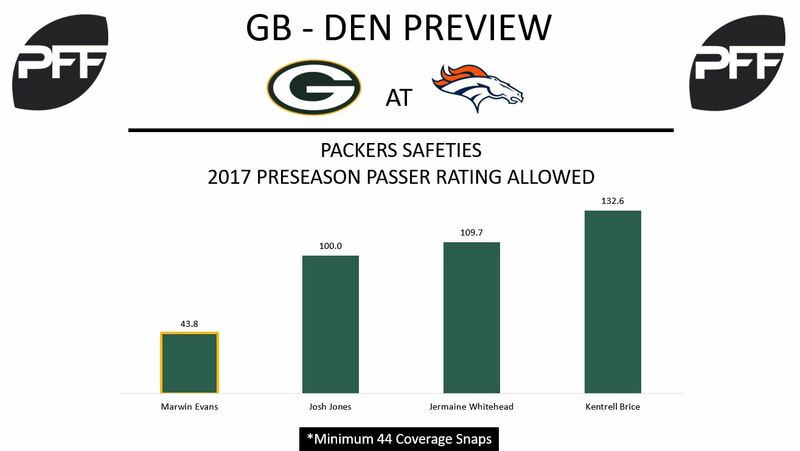 Chris Lewis-Harris, CB – Lewis-Harris has played 78 snaps this preseason, most on the Broncos. His 78.2 cumulative grade is tops among Broncos cornerbacks, and he has allowed a passer rating of 76.6 (26th of 62 qualifying cornerbacks). Lewis-Harris has just 137 career regular season snaps under his belt in five seasons, though he could make a push for playing time this season if he can continue building on his preseason performance. 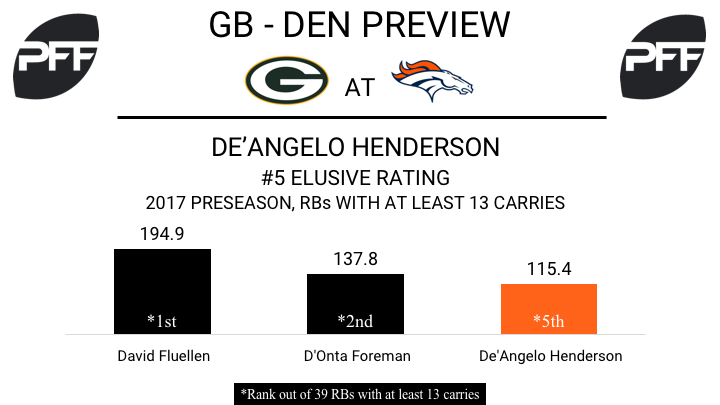 De’Angelo Henderson, RB – After a strong showing against the Chicago Bears scoring the go-ahead touchdown and posting a 82.6 overall grade, the 2017 sixth-round pick showed he deserves a spot on the roster after another solid performance in Week 2. Henderson’s 115.4 elusive rating (boils down a runner’s success beyond the point of being helped by his blockers) ranks fifth out of 39 running backs with at least 13 carries.